This paper explores the integration of secular and religious developmental discourses in integrated development approaches, focusing on the nature of such integration and the construction and operationalisation of meanings within integrated discourses. The investigation is pursued using the case study the integrated approach of Transformational Developmental within World Vision South Africa. 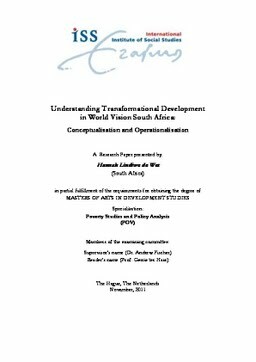 Understandings of Transformational Development within World Vision are found to be multiple, and are analysed in terms of the degree and functioning of the integration between discourses, and as dynamically constructed and contextually embedded.